Summer is the time when most of the shops are having big sales and you have to manage to visit them all. 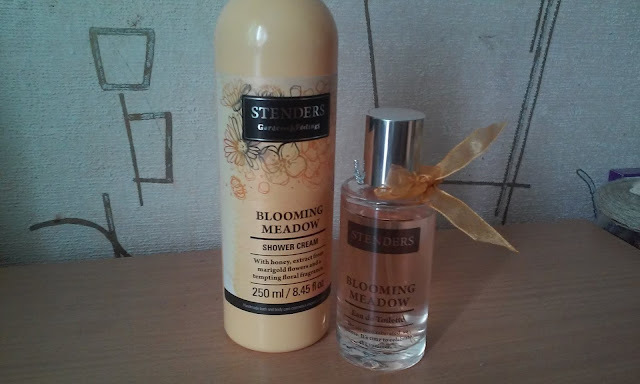 My favourite cosmetic shop ''Stenders'' is one of them and I, of corse, bought lots of amazing stuff and today I will tell more about Blooming Meadow collection's shower cream and perfume. You can read all the info about Stenders here where I explained all about them and what they do. If you are interested in their products you can see all them here and shop online. They ship worldwide. Now let's talk about the Blooming Meadow shower cream. Indulge the blooming burst of midsummer flowers when showering with this fragrant body wash. Enriched with the skin-soothing honey and extract from marigold flowers, the cream creates airy,generous lather to delicately cleanse your body. Feel the sweet scent of flowers adorning your skin with an enticing bouquet of jasmine, orange blossoms, ylang-ylang, gardenia and lily the valley. I absolutely love the smell of this shower cream and also it's really gentle to my sensitive skin. It doesn't make skin dry. A nice,not unobtrusive smells stay on your skin afterwards. Blooming Meadow Eau de toilette. The air is so saturated, so intense. It is time to celebrate the summer. Blooming meadows and lush gardens welcome you to inhale the sweet temptation of flowers. Nature is as alive as ever and you feel so energised and present. You are aware of all your senses, and you slowly merge with this blooming burst of midsummer flowers. This tempting floral fragrance opens with the full-of-freshness fruity notes. An enticing bouquet of jasmine, orange blossoms, ylang-ylang, gardenia and Lilly of the valley blooms at its very heart with the lingering base of sophisticated cashmere, warm amber and alluringly sweet vanilla. I think the descriptions of this fragrance says it all. If you are a fan of sweet and tasty perfume, then this is the real one. You don't need a lot for one time because it's strong and stays long. I'm very happy about these products and I love them very much. If you love how nature smells then Stender's is right for you.